The Everywhere Bear lives on a shelf in class one. Every weekend he goes home with one of the children and has different adventures, going on bus rides, making dens, even going to the moon! One day he has a much bigger adventure when he is dropped in a puddle on a rainy day. He is washed down a drain, in the sea, a fisherman’s catch, a skip at the dump, a seagull’s mouth before being picked up by a friendly librarian. When Class One visit the library they are finally reunited with their Everywhere Bear! 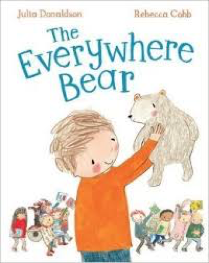 Before you start reading look at the cover and imagine together why the story might be called the ‘Everywhere Bear’. Read the story aloud, pausing to think about what might happen next when the bear is washed down the drain and what the children’s favourite place might be. When you read the book again children might like to join in with parts of the story, for example some of the things you children do with the bear at the weekends or by completing some of the rhymes eg give it a cuddle, tumbled into a puddle. They might like to spot the names on the children’s trays in the classroom illustrations. Which illustration or part of the story do children like best? What do they like about it? Would your child have liked anything different to have happened in the story? What would your child like to do with the Everywhere Bear if they brought it home from school or nursery? Children can play with a toy of their own like the children in class one do, you could look back at the story together for ideas. Help children take photos of themselves with a chosen toy doing different things. Stick them in a small notebook to make a photo album. Talk about the photos together. You could add captions too. Have an imaginary conversation with the bear – children could choose to be the bear or the questioner and you could take the other role. Ask him questions about where he has been and what it was like. Print off the base board and chance cards and play a board game about the story together. If not already a member you could find your local library and subscribe or you could just spend some time browsing and finding interesting books and sharing a story there.